The Marines say the Ospreys are twice as fast, can travel six times farther and are capable of carrying three times the weight of the Vietnam-era CH-46E helicopters which have supported missions involving the president. 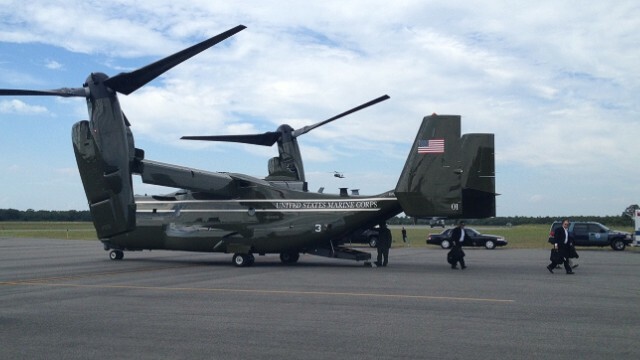 There are no plans yet to have the president fly in the MV-22s. The Osprey has raised some safety concerns over the years. It earned the unceremonious nickname “the Widowmaker” after crashes during initial development and testing. In late 2000, the Corps grounded the fleet after two crashes, one in Arizona killing four crew members and 15 passengers and another in North Carolina that killed the crew. But engineers redesigned the craft for improved safety and the Marines have used them extensively in Afghanistan. Plans to build a new fleet of helicopters to be used as Marine One have hit multiple budgetary snags over the years. Obama canceled plans for a new fleet back in 2009 after projected costs soared to $11 billion. Esto es ¡sorprendente! No he leído algo como esto desde hace mucho . Es agradable hallar a alguien con algunas ideas propias sobre este tema. Esta web es algo que se necesita en la blogoesfera , alguien con un poco de sinceridad. Un trabajo útil para traer algo nuevo a la red. Gracias de todos lo que te leemos. The Osprey is a beast! read this again. "The Marines say the Ospreys are twice as fast, can travel six times farther and are capable of carrying three times the weight of the Vietnam-era CH-46E helicopters which have supported missions involving the president." Think about that? It's a game changer. And who ever called it the "widow maker"? Details please if you even have them. This plane has way too many moving parts. It may be logistically important because of its taking off vertically, but not quite there yet. The president is right not to use this craft as a means of transportation. How much did it cost to fly their dog in on one of those things? If you survive the flight, you should get a medal. Nice. This article completely failed to mention that this was for Obama's dog and basketballs. Before Obama admin: 1 fry, coke, ham & chese was five bucks now its 10 bucks...no BS just had it. Yeah, they flew the dog to Martha's Vineyard on that... Barry and family are worthless pieces of garbage that need to permanently go away. Yeah... Can't wait to start building Gas Chambers for Repugs. In 2008, Presidential candidate Barack Obama Obama flew safely in an Osprey in Iraq. There are 2 V-22's in Presidential service. One was sent back the White House to pick up Obama's dog. That's right. A round trip flight with a dog as the only passenger. V-22's are needed in combat zones to evacuate wounded soldiers and are in short supply. These 2 V-22's should be sent there because Obama can learn to live with transportation that is a bit slower and do this in support of the troops. Or can he? The aircraft was full of white house staffers. No... but that was before (talking about Bush here) the internet was used to elect and relect then reelect a US president to the highest office in the land. PLEASE don't deconstruct what I just wrote. I don't like Bush either, but at least he used his own home to vacation in and not use tax payer dollars to rent out an expensive vacation rental estate. How many times has Obama spent tax payer dollars on renting estates (not to mention the jet fuel) in Hawaii and Martha's Vineyard, MA ? Isn't it weird that Obama NEVER EVER uses his own home in Chicago to vacation in ? What a great PR job in connecting with the poor people in America that he cares so much about. The President pays for the his vacation property out of his own pocket. Security, of course, should be the responsibility of taxpayers. W not only vacationed at his ranch but also the Bush family home in Kennebunkport. It is conjecture on your part that W's security detail cost less than Mr. Obama's. At the same point in his presidency, W had vacationed 50 times for 323 days versus the current president who has vacationed 14 times for 95 days. I do support the President as does at least half of America. If you begrudge this president his vacations, What must you think of Mr. Bush! If the two presidents were reversed, you wouldn't complain one bit. way to go...and you can't get a privet sector job because you are censored by Big Big Brother so you don't raise hundreds of millions of dollars for another politican like you did for obama 2012.
just can't hand out those tax payer dollars to the insurance companies and big pharma charging the customer/citizen to gaurenteed poverty on top of all ready unafordable medicare part D prices just since obama care passed a 70 dollar medicine for thirty days now costs two thousand dollars same medicine and packaging (more or less) thirty day supply. Actually this is phoney. Just like everyting else obama does. Hey CNN tell these irrelevent foriegn trolls here to quit their foriegn propaganda especially if it doesn't relate to the site..This extremist foriegn crap about what's bothering them just takes up room! !Het you can delete them as you do me so do your job and delete these foriegners period!Especially this FGHD nut job!! And I thought you cared about freedom of speech. @Big Shiz,I do care but this rambling propaganda that means nothing most times from foriegn idiots that just take up space isn't necessary ..It's not a 1st amendment issue! !Complain about something relevent to the site or move on!! Elite ruling class of America! POTUS dog gets a better vacation than millions of hard working Americans! TERM LIMITS – ONE TERM ONLY FOR EVERY ELECTED OFFICIAL – NO EXCEPTIONS. @Susan,did you complain when you never saw the Bushs in Washington, the Phantom Presidents,both of them constantly on vacations..O that's right you hypocrites put Pres.Obama our first africanamerican president in a different category don't yah,ignorent republican and racist at that!! We had those at PAX River Naval Air Station. One awesome Flying Machine. Kinda like the Harrier Jets I saw at Cherry Point, NC, but a lot safer. They both blow your mind if you're not expecting it. Hey Steveo I couldn't return a comment about your post about the other article like this one but just like this one it doesn't explain to the extent what or how many Osprey will be used ..Now like I said they'll be more efficient in fuel savings over the fleet of jets that Pres.Obama has now in Air Force 1,2,others and are better in basic maneuvers than those clumsy Chinooks without tying up an entire air port when they arrive like now,makes sense...And again on my cell it doesn't state how many will be used that's all..I'd post further but like I said my threads I read here on my cell are probibly smaller than a typical computer,that's all I have where I'm at,thanks!! It is good to know that aircraft has been redesigned for safe and security just like http://www.FireflightUAS.com. By the way thanks for the information. Call sign. DOG 1. ? Sounds great! Glad to know that the craft will redesigned for more safety and I am sure marines feel the same way too. can't wait to hear that flying saucer dropped a large bomb on Yemen. Most problems have been taken care of, these are also the most recent model so a lot of earlier problems that plagued the aircraft are not present. What the article fails to mention is that the Osprey was used to transport "Bo" the President's dog. (Imagine that – CNN not telling the whole story). Now, how much extra did this cost the American Taxpayer? I really don't care that Barry took another vacation, I just wish he showed an ounce of restraint when it comes to spending other people's money. Not that Barry gives cares. Concur!!! But then as you say.. It's not his money. And you fail to mention that the osprey did not have Bo alone. It was filled with white house staffers. Did you make the same criticisms about "W's" vacation expenditures and time off? Hey BING, "W" vacationed at his own home,not every where else but his "home town" of Chicago. He used Airforce One for his entire family. If it not a buisness trip he's required to pay for the expenses. You must be another Osama lover and don't mind that he spends taxpayer money by the millions when the U.S. is broke?? @CJ,get with the program bud..Are you delushonal just saying Bushs vacation home in Chicago,remember nitwit in Crawford ,Texas or Kennebunkport ,Maine ...And CJ like I stated facts before Bush took over 450 days off non working or not in his first two years and his father took over 1000 in just one term..Guess what CJ Pres.Obama now has taken a whole 128 days off and nitwit our country is far from broke if you'd pay your share of taxes ! !I also see you're a Bush lover being ignorent enough to not only vote once but twice for that imbecile from Texas didn't yah! !CJ been watching FAUX news too long ha!! Time flies - are you making good things happen with the time you have here on earth?? If no person voted in the US for president the military would insert one of their puppets in the Whitehouse...much like today. The US Gov. does not fight wars since Korea rather it occupys countries and when US Citizens occupy their own "Country" the US standing military agencys lable citizens and people they may or may not know as Ciminals despite the protest being peaceful or not.